This is the bare background you need to know to fully appreciate the context behind our annual IBMA partnership show, which is this Wednesday's fare on Roots. It's a two stage deal. At 4:45 pm we'll go live on the webcast channel with a press conference announcing the nominees for the 2014 IBMA Awards. Then at 7 we'll kick off our regular show with four top flight bluegrass bands. While we never know if our guests will be in the nominee pool, we have a pretty great track record on this front. And this year it's distinctly possible that our lineup - Detour, Balsam Range, Becky Buller or Sam Bush (or their component musicians) – will be in line for a crystal obelisk by the time they take the Liberty Hall stage. 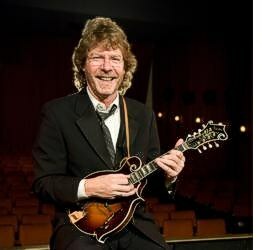 I have to start with Sam Bush and not just because he has quite a few IBMA awards. He's one of the most effective, joyful and enthusiastic champions of bluegrass in the world, as well as one of the finest musicians I've ever known. I might have more records with Sam on them than any other single picker. He played the second Music City Roots we ever staged, and by the time I previewed that show, I'd come to know the entertaining guy behind all those shows I'd seen and albums I'd consumed. He's a brilliant storyteller backed up by a capacious memory, plus a musical curiosity that's as deep and wide as his fealty to old-time mandolin and the legacy of Bill Monroe. After years making his impact with New Grass Revival, the Emmylou Harris Hot Band, Strength In Numbers and dozens of collaborative recordings, Sam cultivated the exceptional Sam Bush Band, featuring Stephen Mougin on guitar and Scott Vestal on banjo, plus the bass/drum rhythm section of Todd Parks and Chris Brown. Whether pumping out reggae-inspired grooves, pulsing danceable funky string band sounds or pure bluegrass, they're as infectious and masterful as any band in acoustic music. It's always peak Roots when they're on our stage. "Five is the sound of a confident band hitting their stride, which is remarkable considering that only a short time ago (singer Buddy) Melton's singing voice was almost permanently silenced. On March 12, 2012, he got kicked while loading cattle on his farm and suffered severe head trauma. . . .His doctors told him it was unlikely that he'd ever be able to sing like he once had. Yet after listening to Five, that prognosis seems inconceivable." Becky Buller is an artist gone solo after some years working for others. Her journey began in a family band up in Minnesota, and she schooled up in both trad fiddle and classical violin. After attending ETSU around the dawn of that school's bluegrass music program, she hit the road fiddling for Valerie Smith & Liberty Pike. During that decade of steady work, she released her first solo material and participated in the IBMA Award-winning Daughters of Bluegrass project. She's just about to release her most fully realized project to date, made for the aforementioned Stephen Mougin's Dark Shadow recording company. A great look at her collaborative spirit and affection for true bluegrass music can be seen in a video mini-doc about the covering Bill Monroe's "Southern Flavor" with a bunch of former Blue Grass Boys. It'll give you a great flavor of Becky's vision and values as a musician. Also with origins up north is the band Detour, from the humming, thriving bluegrass hotbed of, er, Michigan. How sick must they be of that joke now, after seven years of making records? But hey, Opry staff fiddler Matt Combs is from Michigan and so is Greensky Bluegrass. So the mitten state has a lot going on. Maybe it's lake-inspired; they have a lot of them. Detour hooked me with their fine female lead singer. Missy Armstrong's voice is really enticing and easy on the ears. Some veteran pickers flesh out a bold, modern rhythm section. Fiddle player Peter Knupfer is well known as a collaborator with the best, from Byron Berline to Peter Wernick. And banjo man Lloyd Douglas is formerly with Jim & Jesse and Lynn Morris. Our Nashville pal Jeremy Darrow recently joined as bass player. So start your own road to Raleigh with a visit to our Factory or joining the watch parties on Wednesday afternoon. They call the convention's festival component Wide Open Bluegrass, and that's how we'll have the bluegrass tap set for this week. Great music and spirits are going to flow out. Alternately known as the King of Telluride and the King of Newgrass, Bush has been honored by the Americana Music Association and the International Bluegrass Music Association. Bush has helped to expand the horizons of bluegrass music, fusing it with jazz, rock, blues, funk and other styles. He's the co-founder of the genre-bending New Grass Revival and an in-demand musician who has played with everyone from Emmylou Harris and Bela Fleck to Charlie Haden, Lyle Lovett and Garth Brooks. The music from the hills of Kentucky is allowed to take a turn now and then, and this one is for the better. Detour is a Michigan-based bluegrass band that combines original contemporary bluegrass sounds with great traditional favorites. Detour's tight focused harmonies, precision instrumentals, and creative melodies take you down a unique bluegrass road. Becky grew up in a very musical southern Minnesota family. If you're a fan of acoustic music, particularly bluegrass, and you haven't heard of fiddler Becky Buller, there's a good chance you've heard some of her songs. Becky's compositions have been recorded by Ricky Skaggs, Rhonda Vincent, Doyle Lawson & Quicksilver, Josh Williams, and Russell Moore & IIIrd Tyme Out. Bluegrass says a lot of what this band is about, but equally important are the aspects of Gospel and Country Music. All the band members grew up in the rich musical heritage of the Appalachian South, surrounded by culture and heritage steeped in traditions of The Grand Ole Opry…as well as the important influences of the Scotch-Irish settlers of the Southern Mountains, English ballads, Western songs…and tunes written by the band members themselves.